Early Game Boy cartridges that save games use battery-backed SRAM cartridges to hold data between plays. It’s recently arisen that the batteries in them are expected to start dying soon. Critically: a lot of Pokemon from a lot of childhoods are facing extinction. Luckily, thanks to the Pandocs  and a lot of patience from other developers, people have started building their own dumpers. This post details another implementation, built for PIC16 devices instead of the existing Arduino and AVR implementations. It is heavily based on the InsideGadgets Arduino GBCartRead project . There's a ROM dumper under this rat's nest, honest. I built my dumper around a PIC16F690. It’s got just enough pins to drive a couple of shift registers, a UART and to leave enough pins left over for I/O. The most difficult part to get is the cartridge connector – a donor Game Boy is required unfortunately. The schematic is fairly straightforward. The PIC communicates with the PC via a MAX232. 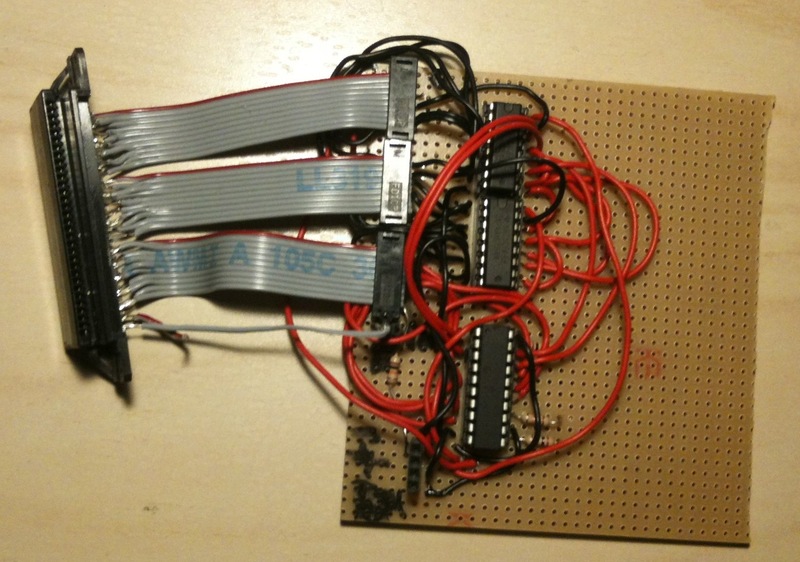 The address lines are driven via two 74HC594 shift registers. Data and control pins take up the remaining pins. Power is supplied via a LM7805 linear regulator (not shown). Game Boy cartridges are fairly simple devices. They use a 32-pin connector which consists of power, three control lines, a 16-bit address bus and an 8-bit data bus. The cartridge shares the address bus with other devices and is mapped to the region 0x0000 to 0x7FFFF . The WR, RD and MREQ pins are all active high. Cartridges larger 16KB require bank switching which is handled by a device called the memory bank controller (MBC). The MBC also controls access to the SRAM, as well as any other peripherals on the cartridge. The MBC is controlled by writing commands to specific addresses. These addresses vary between MBCs, although most seem to enable RAM when 0xA0 is written to 0x0000. The MBC type is readable from the cartridge descriptor which is at 0x0134-0x0148 . The firmware for the PIC is available at GitHub . To use the dumper just connect to it via the serial port. The interface is fairly straight forward. It waits for confirmation before reading the descriptor, it’s pretty straight forward from there. The most important mode to use first is the diagnostics mode, which needs to be run without a cartridge connected. The diagnostics mode is ideal for catching faults before they have real implications. Faults like this one. In this case the WR pin hadn’t been properly soldered. Since the pins are active low and they’re connected via pull-down resistors. That means that the WR signal was 1, so the attempt to read RAM ended up writing garbage to it. I euthanised my Pokemon. Retrieving data (hopefully having not destroyed it) can be done using RealTerm . It features true raw logging which is necessary, as, for example, PuTTY interprets some control characters, even in raw logging mode. At the moment the interface is a bit clunky, as is having to use RealTerm to dump things. I’ll be changing it to speak the same protocol as the original Arduino GBCartRead  which will make dumping things easier.